Some trainees of Chevron Nigeria Limited have protested against what they described as enslavement by the management of the company. 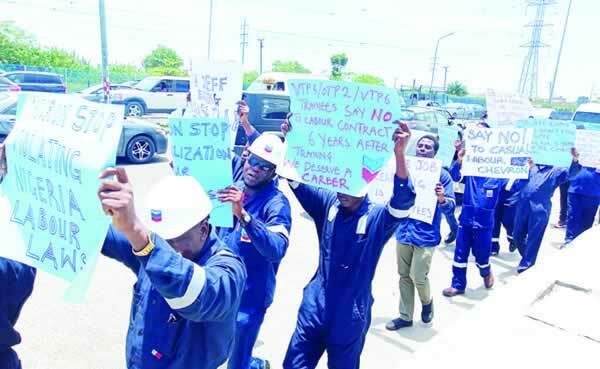 The men and women, who marched on the Lekki-Ajah Expressway, Lagos, alleged that Chevron wasted more than five years of their lives by promising them jobs which they never got. They also alleged that instead of being employed, they got training contracts, adding that the action was against labour laws of the country. The Punch was told that the trainees were from the Escravos Gas to Liquid Plant and other Chevron field operations in the Niger Delta. It was gathered that about 30 of the 151 affected trainees were First Class graduates, while others reportedly left their executive positions in other companies to join Chevron after scaling the highly competitive selection process. One of the protesters, Okunufa Mandy, said they were mobilised in 2013. He said, “In 2013, we were mobilised to Chevron Nigeria Limited. We got offers through a recruiting agency. Initially, we did not know it was Chevron; we were only told an oil and gas company needed workers. “Upon attending the interviews, we discovered that it was Chevron. We were told that we were being mobilised for operators and technician roles in the company. We were informed that four sets had been mobilised before us and employed. We came in under the Vocal Training Programme (VTP 5). “We went to Ogere, Ogun State, for training. The company told us that it would be handing us over to a training provider, who would train us for two years, after which we would be employed in their facilities. “This is 2018, Chevron, in an act of wickedness has continued to roll out continuous training contracts. Each time a training contract expires, we get something like, ‘Due to your performance, we are extending your contract.’ We have asked them several times if it means we all failed or we are not trainable. Another trainee, Lawal Solomon, alleged that at the expiration of the first two years of training, they were not issued certificates. He lamented that despite having employment opportunities from two other oil companies, he chose Chevron with the hope of a better prospect. Another worker, Utomi Okoye, who claimed to have been in the maintenance department of Chevron for five years, said the company could not use low oil price as an excuse. He said, “From precedence, Chevron has been doing this training from 2006. And in the National Content publication of the company, first edition, volume one, page 18, it was stated that the training was for entry level employees and to improve the skills of existing employees. The same training we went through was what others went through and as we speak, VTP 1 to 4 have been employed. Okoye said when the trainees became apprehensive of their fates, they approached their supervisors, who referred them to the coordinators. He said the coordinators further referred them to the superintendents who asked them to see the general manager in charge of operations. “They all said their hands were tied and that the issue was in the hands of the management of Chevron Nigeria Limited. We came to the headquarters on Monday and Tuesday, asking that the managing director should grant us audience. But we were told he could not attend to us. “When my set came for the training, the company, which is complaining that the business environment is not conducive, sent another 50 for training. We believe it is a clandestine plan to make us casual workers,” he added. Another protester, Chisom Emmanuel, said if he knew the training would turn into a nightmare, he would not have gone for it. The Manager, Communications, Chevron Nigeria Limited, Mr Sola Adebawo, and the Human Resources Director, Ihuoma Onyearugha, did not pick their calls when contacted by Punch Metro.